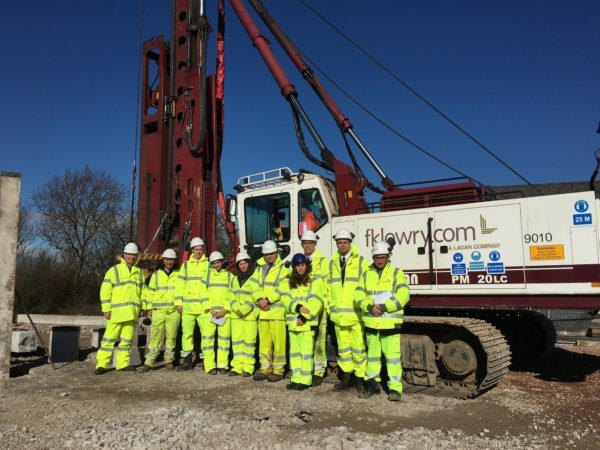 FK Lowry Piling has recently completed a second phase of preliminary pile testing for client, Amey for the proposed new Stafford Western Access Route. The £60,000 project took two weeks to complete. The Stafford Western Access Route (SWAR) will be a new road connecting the A518 Newport Road to the A34 Foregate Street, Stafford, as part of a growth deal for Staffordshire and Stoke-on-Trent. In early 2016, FK Lowry Piling designed, installed and tested sacrificial Driven Precast Piles. The trial piling operation was required to determine the suitability of the permanent pile foundations for the Stafford Western Access Route scheme. In recent Months, FK Lowry Piling re-mobilised to Site with their new Soilmec SR-75 and Juntann PMX-20 Piling Rigs to install Bored Displacement Piles, Driven Precast Piles and sacrificial Anchor Piles. Precast and Bored Displacement Piles underwent Static Load Testing, Dynamic Testing together with Vibration Monitoring.